Made from the new super soft, Cuddle Me vinyl, this fair skinned brown eyed boy with brown hair is 20 inches long with a soft cloth body. Outta This World and the perfect companion and friend, ToddlerTime Doll Cosmic Boy is ready to play and take orbit space…with you! He comes dressed in a white long-sleeved orbit t-shirt under a silver puffy vest with zip front and midnight blue twill pants. His silver books are out of this world! His midnight blue baseball style cap and silver shoes are truly cosmic! Cosmic Boy's cropped brown hair compliments his beautiful brown eyes and sweet rosy cheeks. Adora ToddlerTime Dolls are 20” from head to toe, made of baby powder scented high quality Cuddle Me™ vinyl with movable head, and ¾ vinyl arms and legs. NEW Cuddle Me™ Vinyl is soft, silky, gentle and feels more like a real baby, making these toddlers perfect for play! 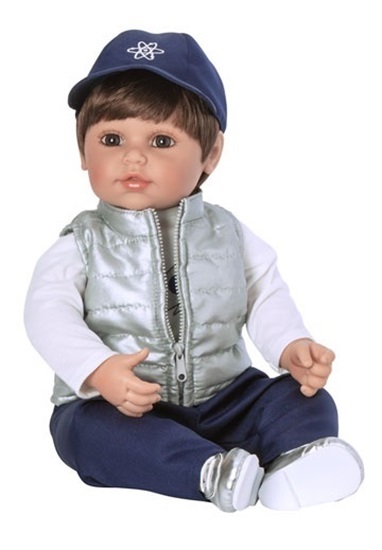 Each toddler doll has a weighted cloth body and comes complete with a traditional diaper for realistic play to develop social skills while engaging in nurturing, pretend play! Cosmic Boy is perfect for ages 6 and up.